Regus is the world's largest provider of instant offices running 3000 business centers in 900 cities. 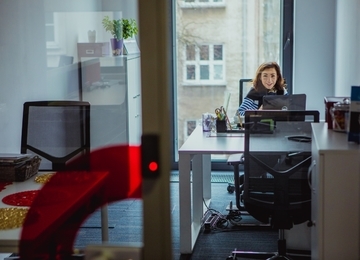 Regus businees center in Lublin offers 700 sq m of office space located on the 4th floor of Zana 39A office building. Regus offers a fully equipped workstations - single, double or triple rooms are furnished and ready for use immediately. Regus Lublin is located in the city center of e city on 39A Tomasza Zana Street - one of the most important and recognizable streets in Lublin. The location of Zana 39A office building and the proximity of trolleybus and bus stops provide excellent access to public transport. In addition, there are many facilities - shops, hotels, restaurants and cafes available nearby.